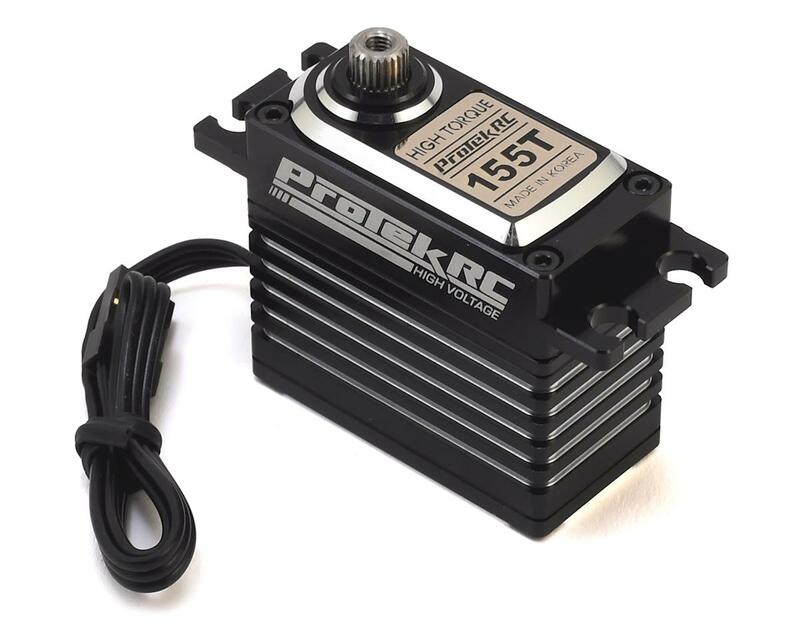 This is the ProTek R/C 155T Digital Hi-Torque Metal Gear High Voltage Servo. 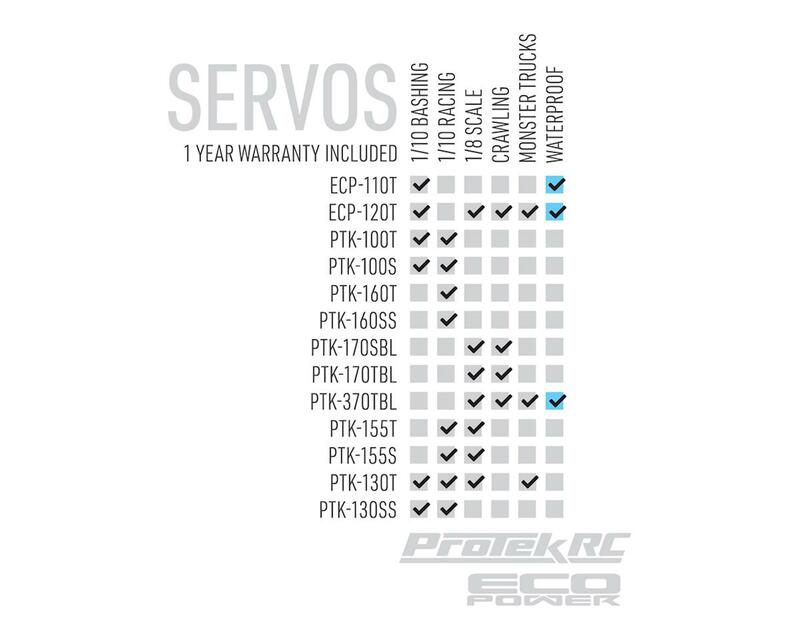 ProTek R/C Servos have been developed to provide enthusiasts with high quality servo's that will exceed expectations at every level. With features that meet or surpass what the competition can provide, ProTek R/C servos deliver performance and unmatched value, with industry leading customer support. 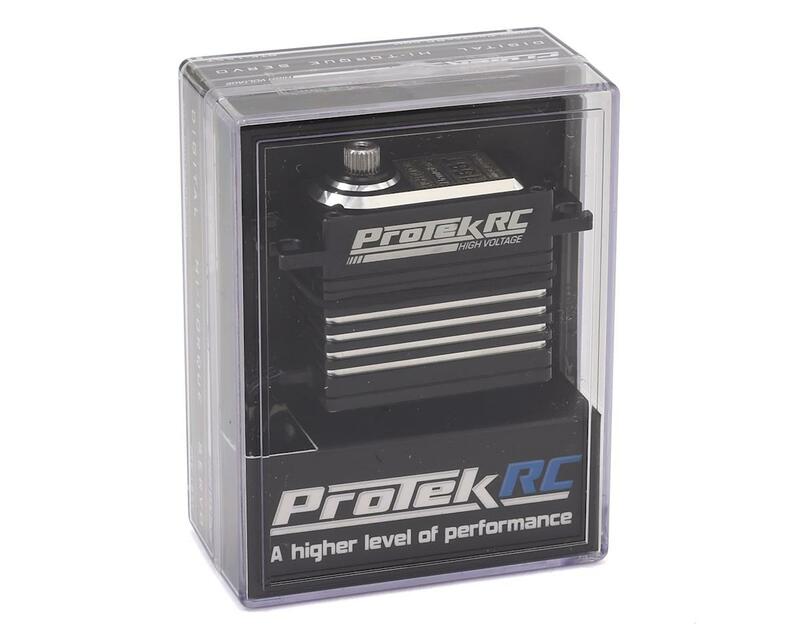 The ProTek R/C 155T High Voltage Hi-Torque servo delivers an incredible 360 oz-in of torque and 0.10 transit speed at 6.0V, and when you bump the voltage to 7.4 the spec's increase to 453 oz-in and 0.08! Spec's like these make this servo an excellent choice for any 1/10 to 1/8 scale vehicle application. Other features include a full aluminum case that provides bomb proof durability and improved heat dissipation, a metal gear train that is supported by dual ball bearings, a 200mm long 22awg connector wire with gold plated connectors, a coreless motor and Conformal Coated circuit board for excellent vibration absorption and element protection (not waterproof). Plus, instead of a cheap plastic servo horn, ProTek R/C goes the extra mile with an included aluminum single arm servo horn that will stand up to a majority of the punishment you can throw at it. Stop wasting your money on budget servos that look good in the spec list, but fall short when its time to perform. Get ProTek and don't look back. The ProTek R/C 155 series is the first to introduce the use of a Conformal Coating: a thin layer of polymeric film that contours to the printed circuit board to protect against vibrations, moisture, dust, chemicals and extreme temperatures. With the application of Conformal Coating, the 155 series is ready for battle. Warning! This ProTek R/C servo requires that you use a m3x10mm screw to attach the servo horn to the output shaft. 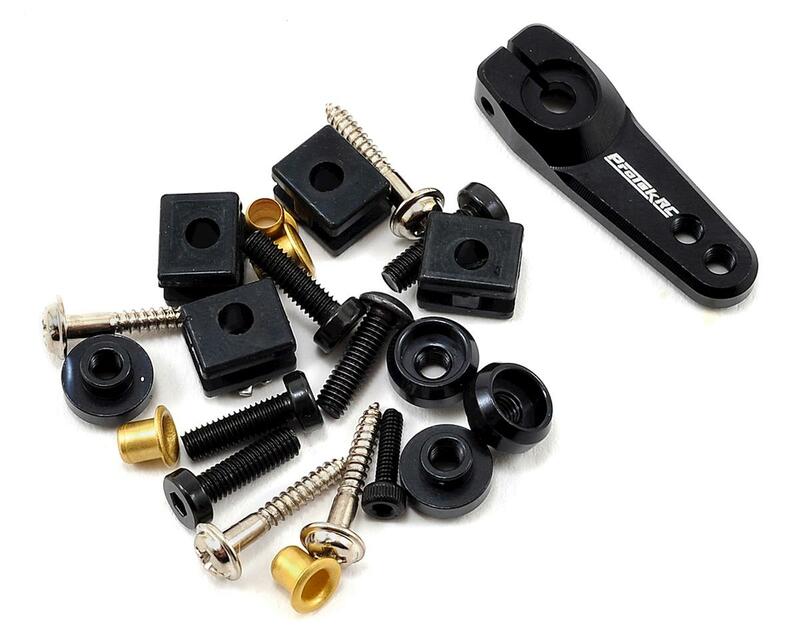 If you choose to use another screw, be sure to use a 10mm length screw. Use of a shorter screw can cause failure and will void your warranty. I’ve got one in my Tekno 410.3 and it works great, no noise and it’s smooth steering. I’m using the Pro-Tek clamping aluminum servo horn. So I haven’t experienced any trouble with the splines as mentioned above. I am using the 170TBL’s in my 1/8 buggy but I’d use these 155T’s in a heart beat. Make them $114.99 and it would be perfect! I bought this servo in June of 2018 and installed it in a Tekno EB48.4. I don't race E-buggy often and probably have less than 15 runs on the servo. It started getting hard to center about a month ago. Now, it is hard to center and within 4 minutes I am fighting this buggy as it pulls hard left. I bought a 155S in December of 2018 and it is already drifting and pulling as of January 2019. I would avoid these servos at all costs. Had issues on both my truggy and buggy getting the m2c throttle/break servo horn on. Had zero issues getting the same horn on my 170sbl servos from protek so I know it’s not the horn. Kinda disappointed in the quality of the splines. Spend the few extra bucks to get the 170sbl/tbl. Has anyone else had this issue with these servos? I spoke to a few other local guys and one had the same issues I’m having. Amain help lol! !